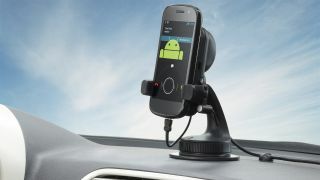 TomTom is taking the wraps off its latest navigation app for Android devices at IFA 2012 today. The good news is that the app does not require a mobile data connection. All of TomTom's finest nav, mapping and traffic data tech has been crammed into the new app, with the company saying it aims to bring its content and services to as many devices and platforms as possible, so adding Android is a no brainer. Key features for the app go something like this. First up, you don't need a data connection. Secondly, you get free map updates for life. Then there's TomTom's HD Traffic service which provides detailed traffic info and alternative routing functionality. It's an additional in-app purchase (no pricing info as yet) and requires an internet connection. To that little lot you can add the usual TomTom frills, including IQ Routes that take into account known traffic patterns, Advanced Lane Guidance to help with tricky junctions, spoken street names and 2D or 3D views. You can also add a speed camera database, again for a currently undisclosed fee. The new app compliments TomTom's Hands-free Kit for Smartphones, which allows users to charge their pocketable companion and mount it in-car for easy viewing. A built-in speaker does the audio duties for clearly audible navigation prompts and calls. With standalone nav devices increasingly under the kosh from ever more powerful smartphones and apps, this new Android app is probably essential for keeping TomTom in the game. The app is go for launch in October - tune in to TechRadar to find out if it's up to TomTom's usual high standards.